I don’t know anyone who does not instinctively associate Spain with paella. In Barcelona, however, you’re much more likely to come across fideuá, a paella-type dish made with thin vermicelli noodles instead of rice. I enjoyed a particularly delicious one at ‘Mar Salada’, a restaurant just a stone’s throw from the Barceloneta beachfront. Still, I prefer to make a classic paella, but with a Luxembourgish twist. It’s a meat-based paella which celebrates our national sausage, the Mettwurscht, and combines it with beans and chicken. 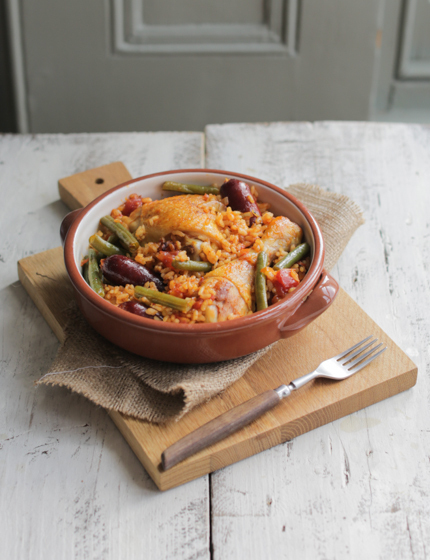 Trust me, it’s really quite straightforward to make this token Spanish dish, and whatever you do, always remember: paella is not a risotto, so don’t stir it! Peel and finely slice the onion, then peel and crush the garlic cloves. Rinse the chicken, pat dry and season with salt and pepper. Cut the Mettwurscht or chorizo into bite-sized pieces. Trim the French beans and cut into bite-sized chunks. Put the saffron into a small bowl and steep in 2 tablespoons of hot water. Heat 2 tablespoons of olive oil in a large frying pan (28cm or larger). Fry the onion in the olive oil for 5 minutes, adding the garlic for the last minute. Remove the onion and garlic and add one tablespoon of olive oil to the pan. Fry the Mettwurscht or chorizo pieces for 4 minutes until cooked on all sides. Remove from the pan. Add the remaining 2 tablespoons of olive oil and fry the chicken for 8 minutes until browned all over. Add the onion and garlic, the tinned tomatoes, wine and smoked paprika, cover the pan with a lid or with foil and leave to cook on a medium heat for 15 minutes. Add the rice and French beans to the frying pan. Pour over enough chicken stock and all the saffron water to cover the rice and beans completely, and give them a stir. Place the browned chicken pieces and Mettwurscht/chorizo pieces on top of the rice. Turn the heat up to high and bring the liquid to the boil. Cook uncovered on a high heat for 10 minutes, not stirring the rice. *this post was sponsored by Expedia, who sent me some Spanish ingredients to make this dish. After 10 minutes, reduce the heat, add the remaining stock and cover the pan with a lid or with foil. Cook for 20 minutes until the rice is al punto (with a little bite to it). If the rice is not cooked enough at this stage, add a bit more water and continue to cook. Once the rice is al punto, remove the paella from the heat and keep covered with the lid or foil. Leave to rest for 5 minutes before serving so it can absorb any remaining liquid. Serve each portion of paella with a lemon wedge and finish off by squeezing some juice over the meat and rice.